Discussion in 'Marion-Osgood Steam Shovel' started by Darren Gunderson, Jun 27, 2012. Some of you may know that another of my hobbies I am pretty passionate about is vintage photography, especially 3D stereocopic forms. 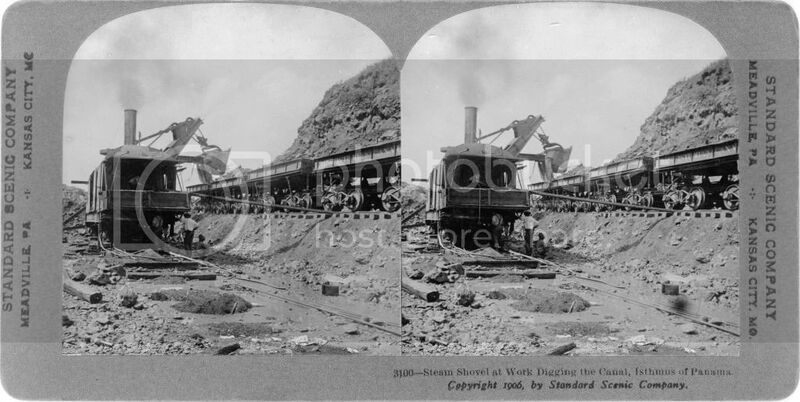 I thought I would post a couple of vintage stereo cards of the steam shovels working at the Panama canal. These are similar to the one being assembled currently. When I went over to see it at steam school it reminded me I had these and how similar they were. These are on railroad trucks but other things are fairly close. I imagine most will not be able to view these in 3D as intended unless you have a stereocope handy. You can train your eyes to fuse the two images, but it is easier to start with a stereoscope. And one from the back. You can just make out the fireman. Cool Darren! Wish I had a way to look at them the way they were intended! People are looking at me funny trying to get the full effect from my laptop here at the truck stop! Mark just cross your eyes till you see 3 pictures! Darren not sure if you know this, but the shovel we have at the hill was once a rail machine also. 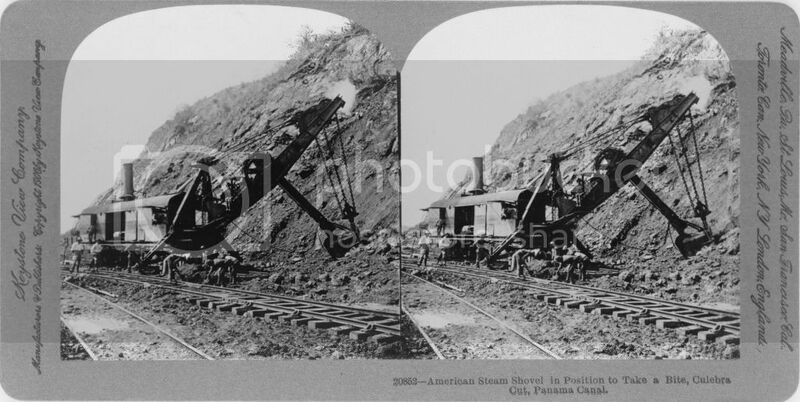 It was converted over to the wheels before it went into the rock quarry. That method you describe works very well if the images are switched around so the left eye view is in the right position and the right eye is in the left position. When they are in the proper order like they are here you need to look beyond the image and slightly diverge your eyes. I can crossview much easier than parallel but some people are just the opposite. If you cross eye view these, the near points will look far away and the far away objects will look close. It is called psudostereo. The stereoscopes had a wedge shaped lens that would cause your eyes to be able to focus on the correct image and merge the two into one view. I did not realize that it had been converted. That is great to know. That makes these images even more closely related to our shovel. Thanks for the input. I am going to isolate a few areas of these and post enlargments for detail a little later. The cabs on these are numbered. Too bad Rollag's doesn't have those kind of markings left. Now I have people laughing at me! I am holding my laptop upside-down looking at it cross-eye'd! Someone said something about calling an ambulance! I better try again from the privacy of my own home! Aww, dang... Should've pulled these pictures up on the phone at the local fair this weekend. The historical society had a stereoscope on display..